The chill of fall is in the air. This is the time of year to throw on the sweater and enjoy a stroll watching the leaves on the trees change from green into lovely shades of the fall season. This is the perfect time of year to clean the summer out of the abode and get the décor organized and ready for cuddling indoors during the colder months. Involve the entire household with contributing to the chores daily. Rise and shine early enough for the bed to me made before heading off to school or work. 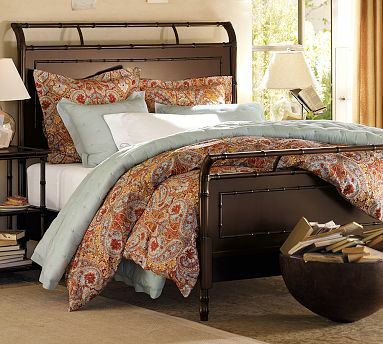 Even if the rest of the room is a bit messy, the clean bed will bring a sense of cleanliness. Remember less is more. Make the bed easy to make with just a duvet and minimal pillows. Every morning the bare floors should be swept clean. Members of the house can take turns sweeping. This will keep the dirt and dust at bay. After bathing each person can quickly spray and clean bathroom surfaces. You can keep the bath cleanser in the tub or shower for quick use. Everyone, including children, should be responsible to make sure the kitchen sink is clear and clean. Clean dishes, pot, etc. right after using to prevent a pileup. Tables and countertops should be kept clear of debris. Clear off newspapers and junk mail as you read them. Do not let these items accumulate. Have a container specifically for recyclables to be dropped in as they are finished being used. Keep your desk papers organized so your desk and surfaces stay tidy. Keep important papers neatly stacked in letter trays or use pretty baskets or boxes. Make a tray for each member of the household. These should be sorted through weekly so that the unnecessary items can be discarded and important items can be taken care of and filed away. Make sure that everyone has their own space to do their home work. Before bedtime is the perfect time to make sure that all desk tops are neat and clear with all home work completed and papers in place to take to school or work. Cleaning does not need to take up a lot of your time. Laundry can be multitasked with other chores or working out. Vacuuming can be accomplished in increments, doing a few rooms at a time and spreading it out throughout the week and members of the household. Dust as you go. Every day dust a different surface. It will keep the dusting time down to a minimum. This is the perfect chore for everyone of any age in the household to have their own designated surfaces to dust. At least one day should be devoted to heavier cleaning like washing floors and windows. Make sure that everybody takes turns doing these chores. A check list can be made and posted so that everyone can check off each task as it is completed. Making a list is a useful tool for children to learn about the need to stay organized and clean as well as providing time management skills. For roommates a list provides a mediator to make chores equally divided. The colder months are coming. Huddled inside you will be much more comfortable with organized surroundings. A neater abode promotes a calmer and more relaxed home environment. Everyone will be happy. Time to get the fireplace ready, turn up the Jazz and never be afraid to dance!